Kupang - East Nusa Tenggara (NTT) : Waterfall or Beach? Kupang, Capital city of East Nusa Tenggara Timur (NTT) province had lots of amazing tourist area. At least there are two tourists locations which always visited by domestic or foreign tourists, especially Australia. 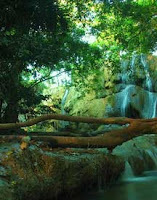 They are Oenesu waterfall (17 km from Kupang city) and Lasiana Beach (12 km from Kupang). 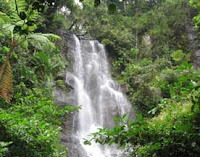 Oenesu waterfall is the main tourist destination. At holiday or weekend, this place visited more than 1,500 people. You have to go along the trip about 17 km with flawless asphalt pavement. Then, before you enter the waterfall the street become a little bit damage, but you still can move on your trip with public transportation or private wheel. Even at rainy season, you can reach this place because the road not muddy and flood. All cars can park next to the waterfall. Many people came to this place to celebrate their anniversary, religious purpose or just looking around the scenery of the Oenesu waterfall, complete with the sound of wild animal near the jungle. This location is 0.7 hectare, located at subdistrict West Kupang. You can make this place as small adventure with your family, crossing small rivers and climbing small hill around the waterfall. Many protected animals live in here, if you dare you can make interaction with the wild animal. According to Apeles Bangkoles (28 years old), Oenesu waterfall security guard, you have to pay Rp 1,500 for adult to enter this location and Rp 1,000 for children. The parking costs is Rp 2,000 for four wheels and Rp 1,000 for two wheels. This waterfall has unique attractive power. Oenesu has four level, recreation facilities, camping, and jungle adventure. You can take a bath or swim in the lake, fell the falling water to your skin, it feels great. Fell the mountain air while hear the birdling, and the friction branch make a nature harmony. You can enjoy the scenery on summer or rainy season, because the waterfall never stop. 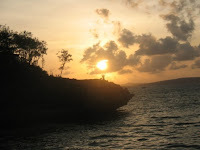 The other tourists location you must see in Kupang is Lasiana beach, 12 km from Kupang. Many people came in this beach at daybreak to see the sunshine and at afternoon to enjoy the beauty of the sunset shine. This place was well known since 1970. In the beginning 1980 many foreign tourists from German, Australia, England, and USA came by. Almost every Sunday they swim and surfing at the bay. Sometimes they lay down to be expose on the white sand. In December 1990 to January 1991, Lariana beach crashed by 6 meters height wave, and overthrow Batu Nona (Lady Stone). Batu Nona is a coral stone, 15 meters height with lady with waving hand shape. Now, this “lady fall a sleep” and getting close over, buried under the sand. Lasiana beach still become the most favorite place for Kupang citizen until now. Every Sunday, thousand people sight seeing this beach, especially on Sunday or national holiday. They bathe, swim, ate roasted corn, epeh banana, and coconut. The sand surface is flat with declivity about 5-10%, suitable for play football. The san is white, clean and shining. The Bottom of the sea is sand, not mud as many other Timor beach. That why the water is clear. What a very wonderful scenery.